Note: We've updated this commentary with data through the November market close. Let's take a closer look at recent activity in US Treasuries. The yield on the 10-year note ended Friday at 3.01% and the 30-year bond closed at 3.30%. Here is a table showing the yields highs and lows and the FFR since 2007 as of the November 30 close. 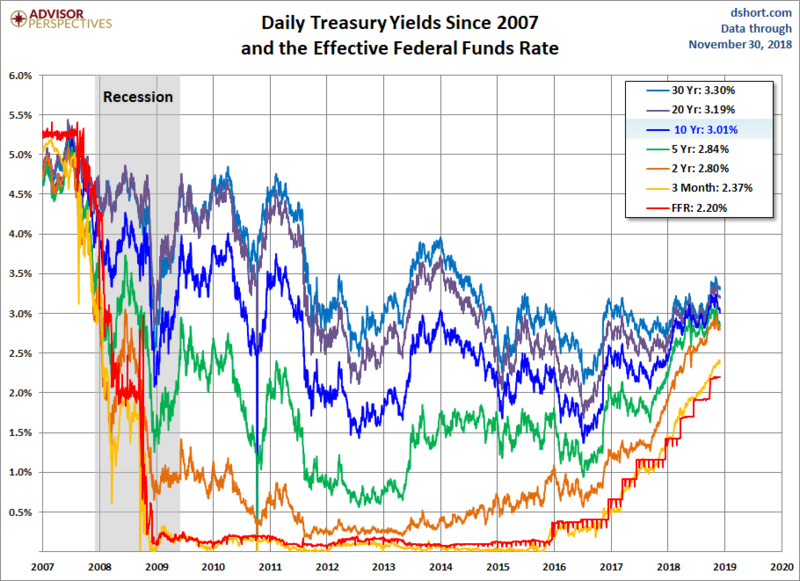 The chart below shows the daily performance of several Treasuries and the Fed Funds Rate (FFR) since the pre-recession days of equity market peaks in 2007. 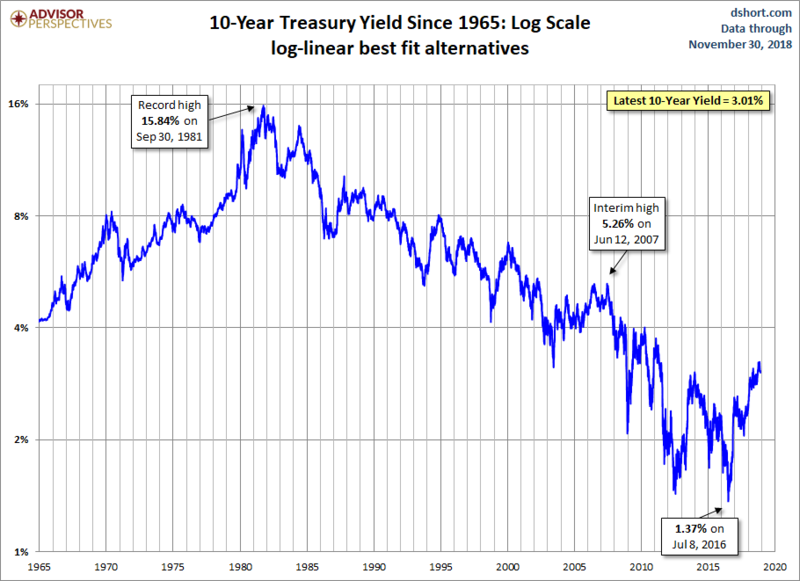 A log-scale snapshot of the 10-year yield offers a more accurate view of the relative change over time. Here is a long look since 1965, starting well before the 1973 Oil Embargo that triggered the era of "stagflation" (economic stagnation with inflation). Note the 1987 closing high on the Friday before the notorious Black Monday market crash. The S&P 500 fell 5.16% that Friday and 20.47% on Black Monday. The latest Freddie Mac Weekly Primary Mortgage Market Survey puts the 30-year fixed at 4.81%. 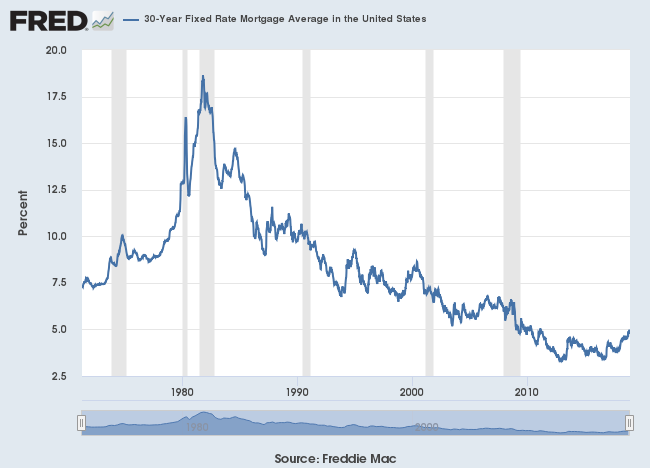 Here is a long look back, courtesy of a FRED graph, of the 30-year fixed rate mortgage average, which began in April of 1971. 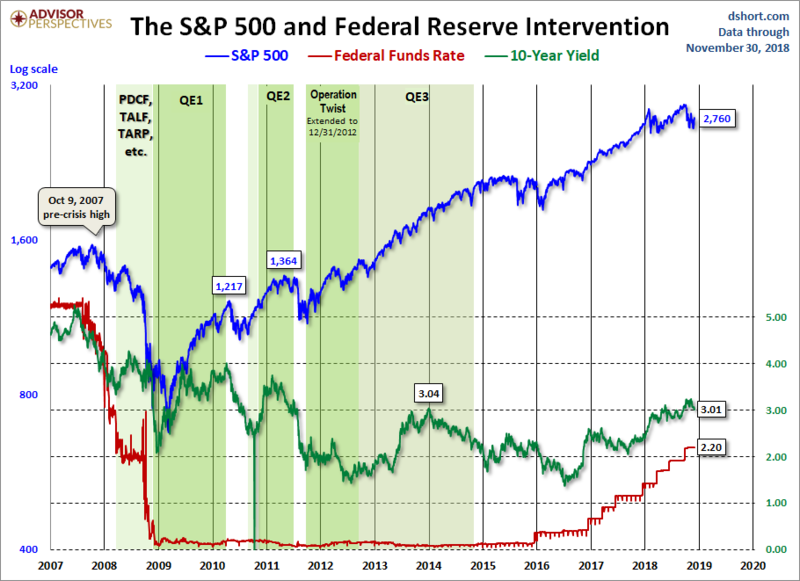 Now let's see the 10-year against the S&P 500 with some notes on Federal Reserve intervention. Fed policy has been a major influence on market behavior. For a long-term view of weekly Treasury yields, also focusing on the 10-year, see our latest Treasury Yields in Perspective update.